Are you looking for a professional painting company in New Canaan CT? 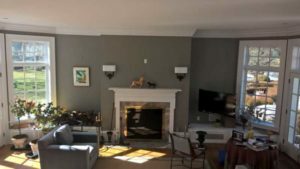 F and F Painting Company provides high quality painting services for homes and businesses in New Canaan & surrounding areas. A small family owned business, we strive to provide the best interior and exterior painting service for our customers. At F and F Painting Company we only use the best equipment and paint for a quality finish you are sure to love for years to come! We know New Canaan homeowners and businesses want their properties to look the best. That is why we start every job with a coat of primer on all walls and ceilings. We apply two finishing coats. We completely clean the surface of whatever we’re painting before we begin. These are just 3 steps in our 12 step process of interior painting. Our attention to the exterior of your home or business is no less focused. We know you expect the best out of your painting contractor. Our goal is nothing short of excellence, every job, every time! We are more than just painting contractors! When hiring a painter for your home or business, you want someone you know you can trust for a professional finish. We take pride in every job we do, we want to help turn your house into a home. Call your New Canaan painters today!